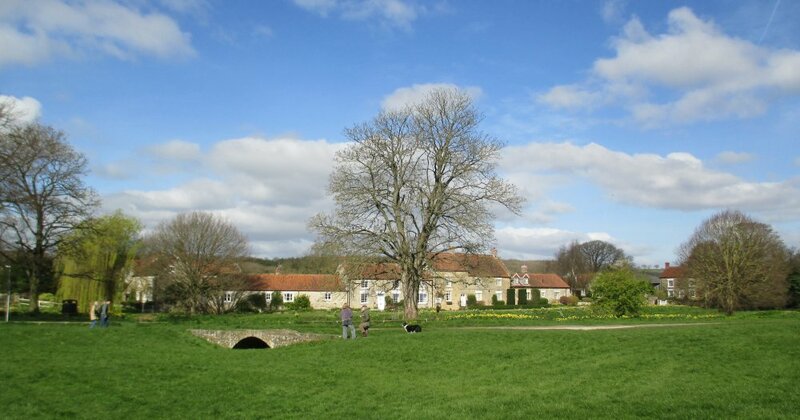 To start, spring views of Sinnington village, a pretty location to start the walk. 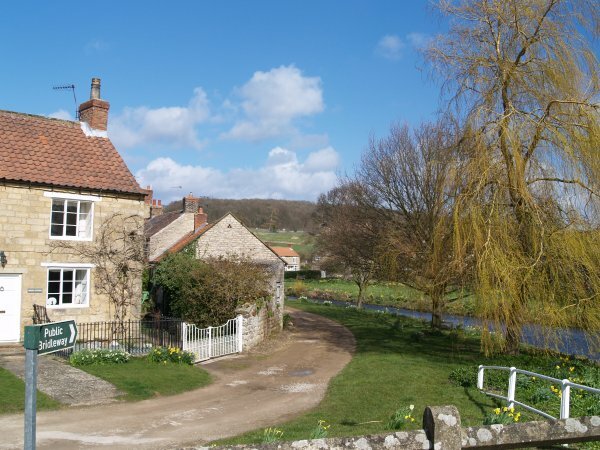 Fine stone houses by the road bridge over the River Seven. 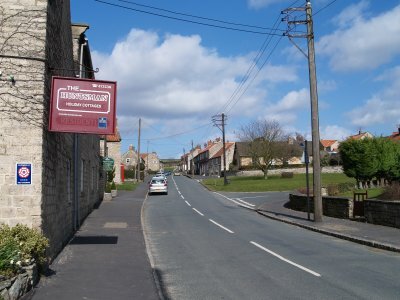 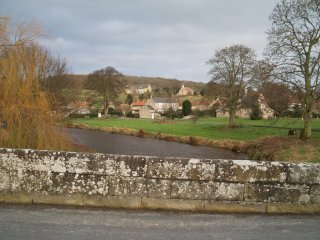 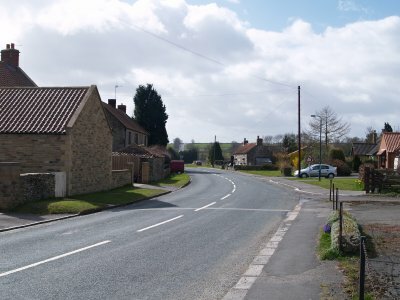 View of the east side of Sinnington from near the road bridge over the river. 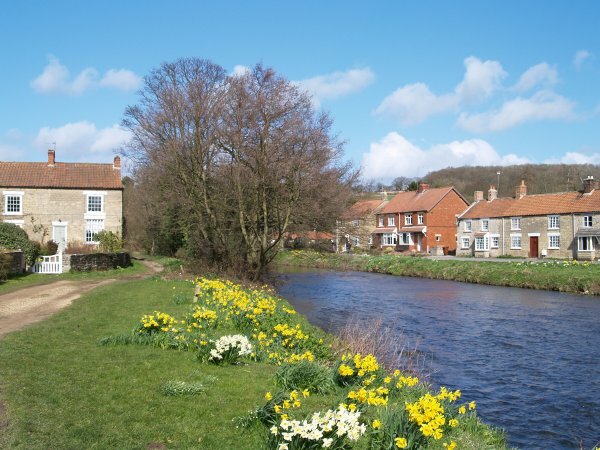 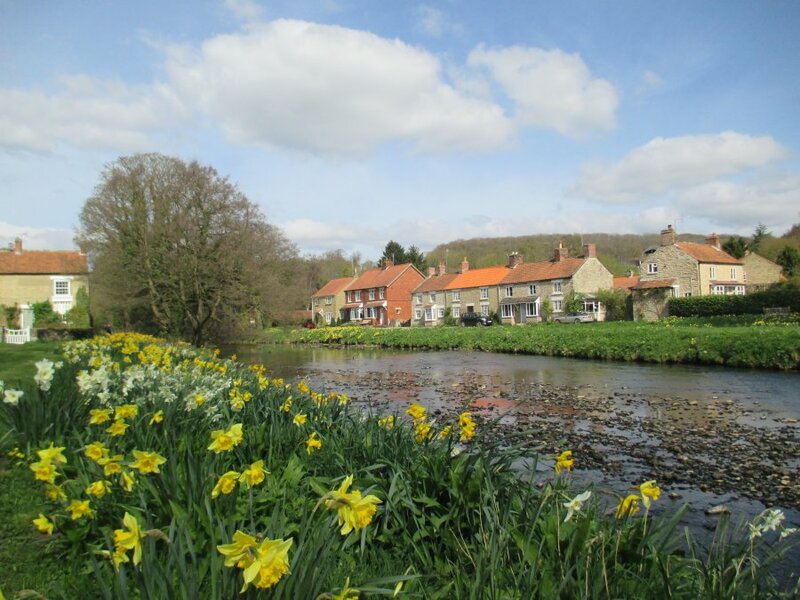 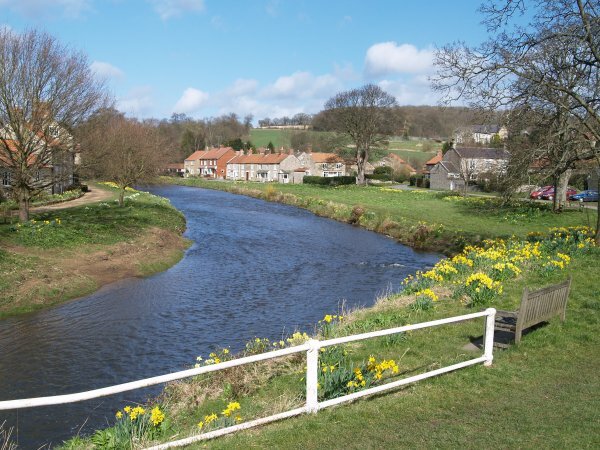 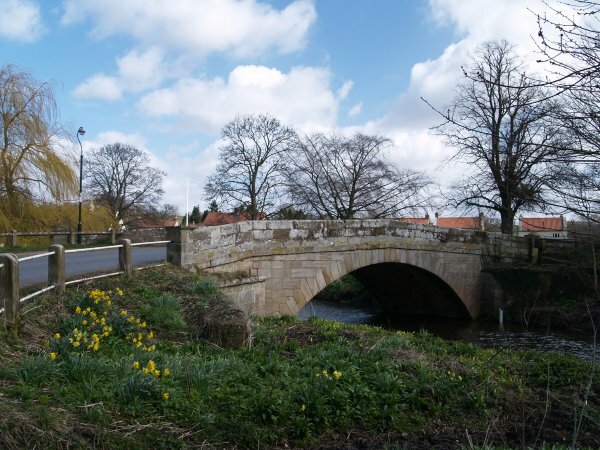 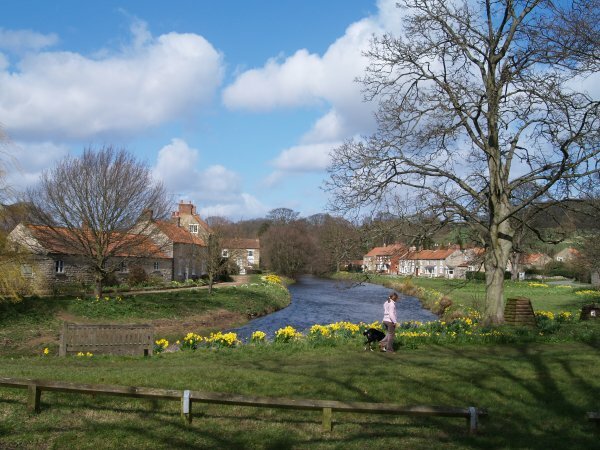 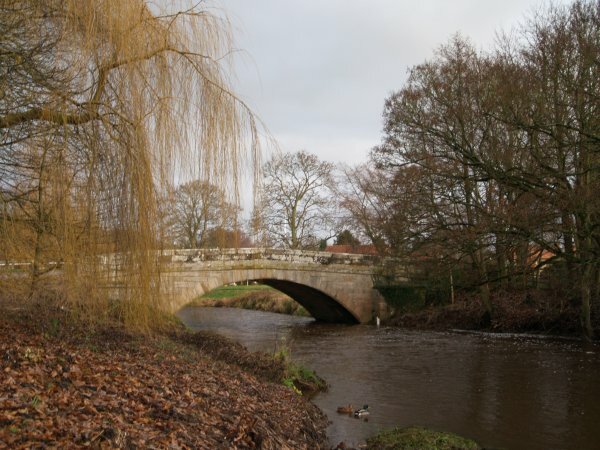 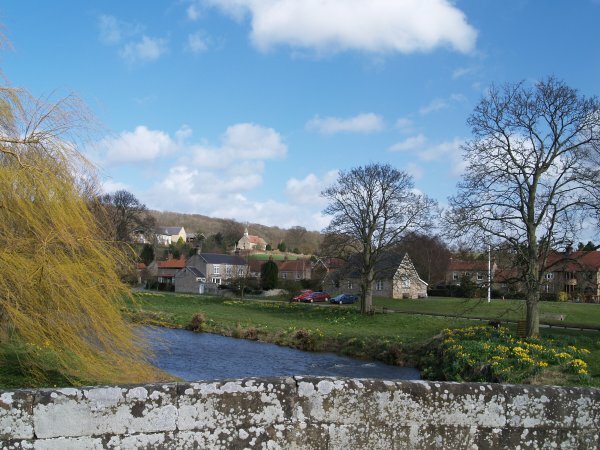 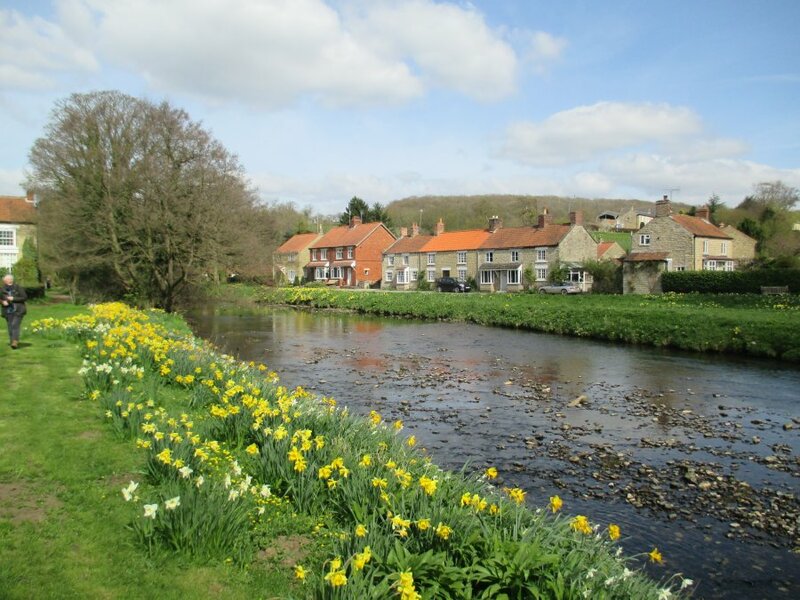 Sinnington is a lovely place to start some Spring walks. 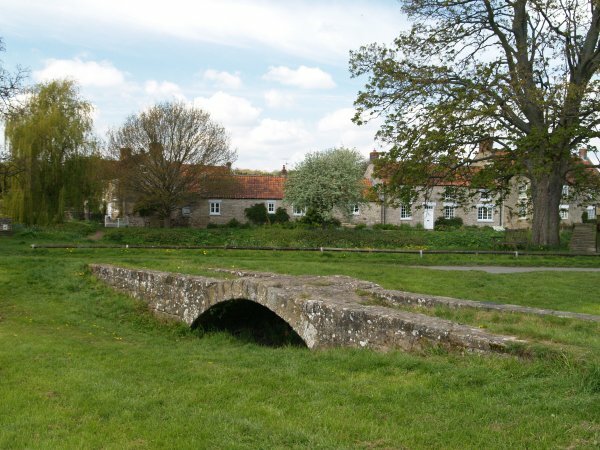 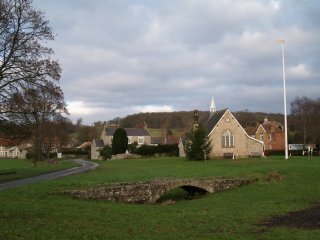 On the way to explore the village church of All Saints, as well as the old schoolhouse with its white pointed tower, you pass the curious remains of an old medieval bridge that goes over nothing but grass and no longer crosses any stream or river? 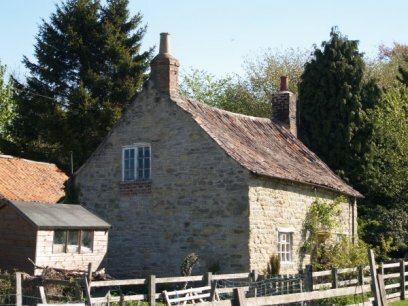 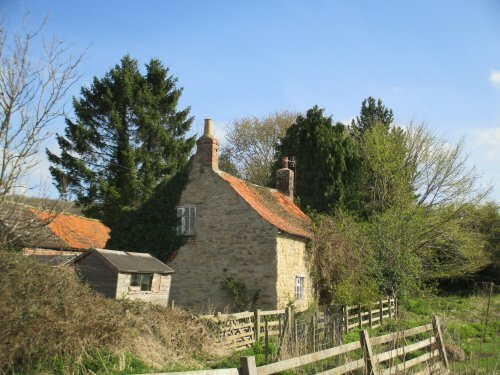 An old cottage at the foot of the lane up to All Saints Church. 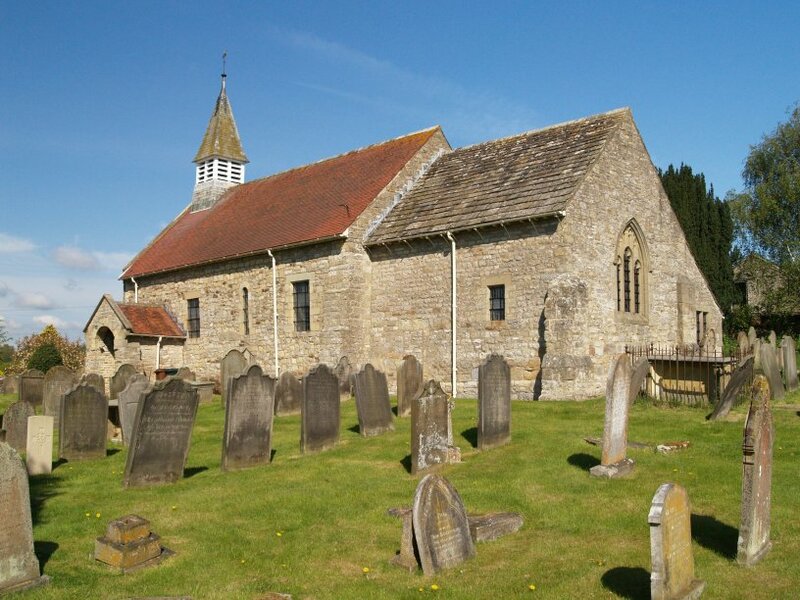 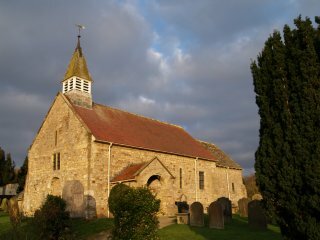 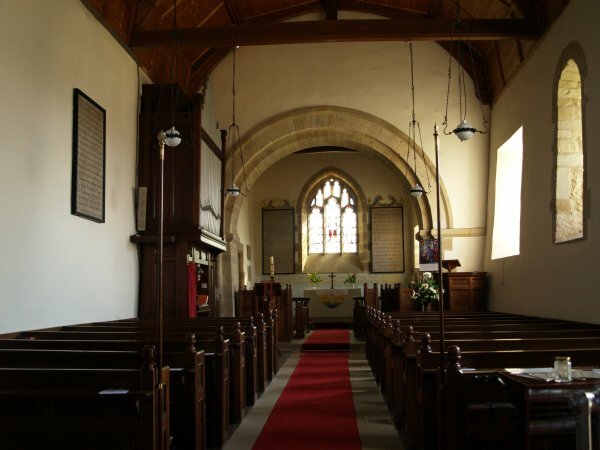 All Saints Church, Sinnington is a lovely little medieval church with a nave, chancel and bell-turret (tower). 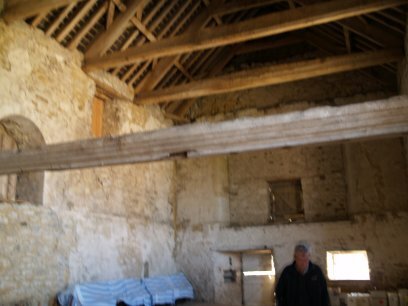 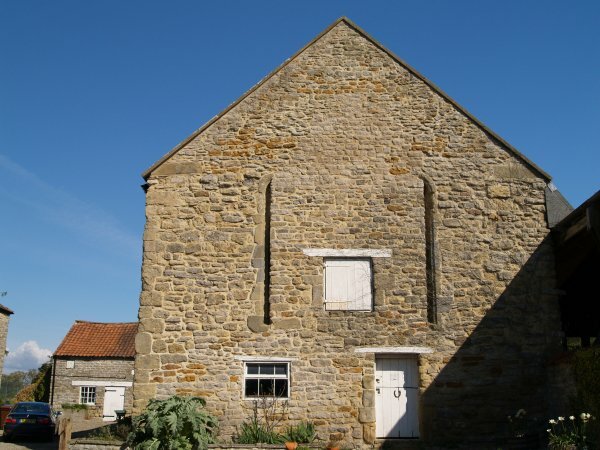 Its origins lie back in Saxon times but the earliest parts of the building date from Norman times. 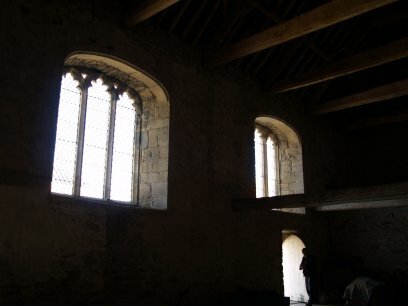 Looking down the nave to the Norman chancel arch, altar and east window. 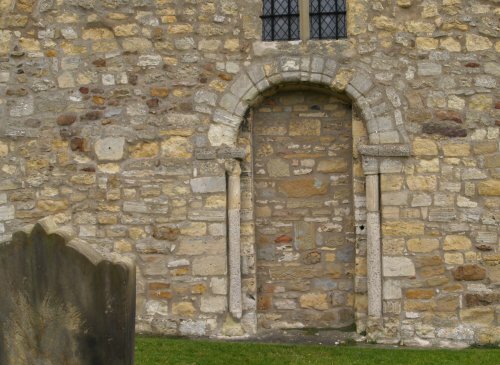 An early Norman doorway, now block off, but the piers and capitals and curved arch survive from the late 12th century. 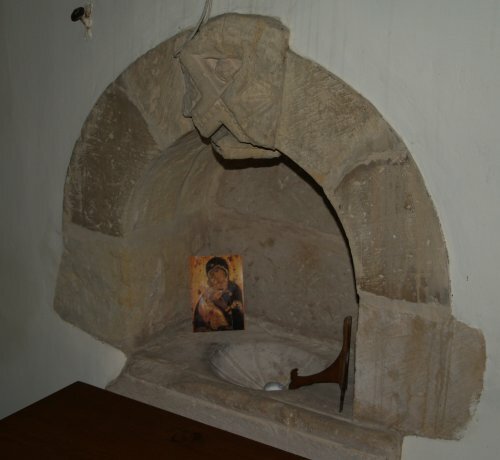 A piscina - a washing bowl for the priests. 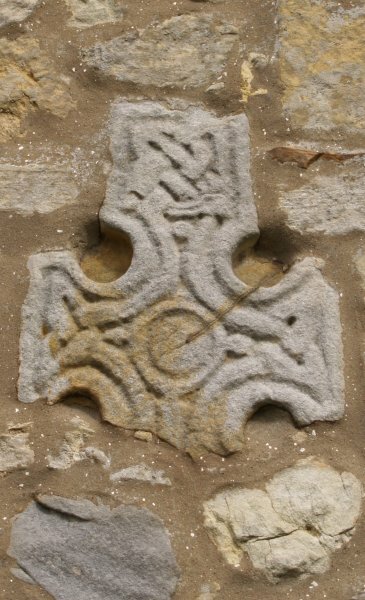 An ancient Anglo-Saxon cross set into the external wall of the nave and another carved fragment in the church - hard to decipher! 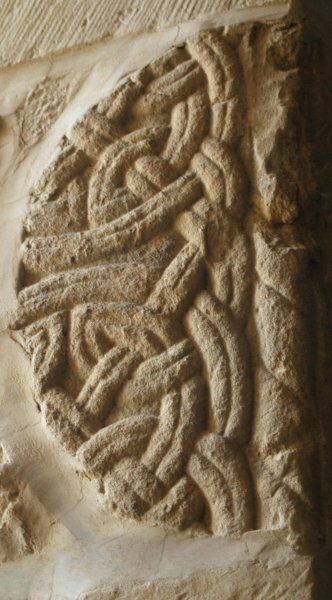 Another fragment of Anglo-Saxon stone carving set into a re-constructed Norman window. 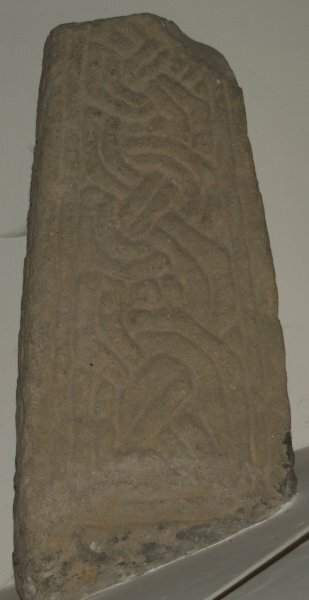 Another Anglo-Saxon (or Anglo-Danish) carving - part of a cross? 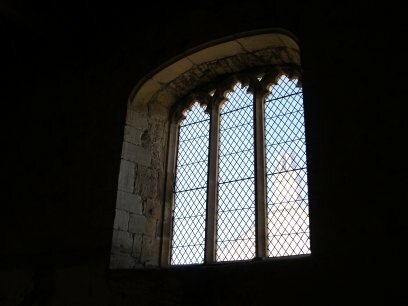 figure of Christ? 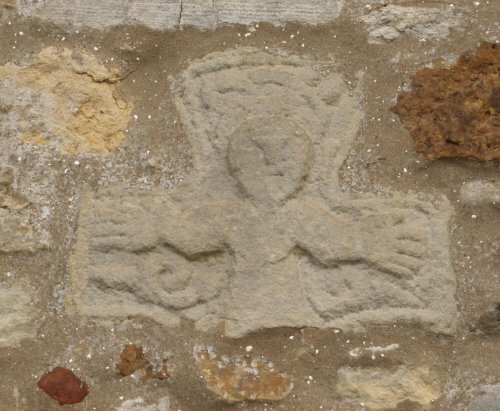 A depiction of the Crucifixion? 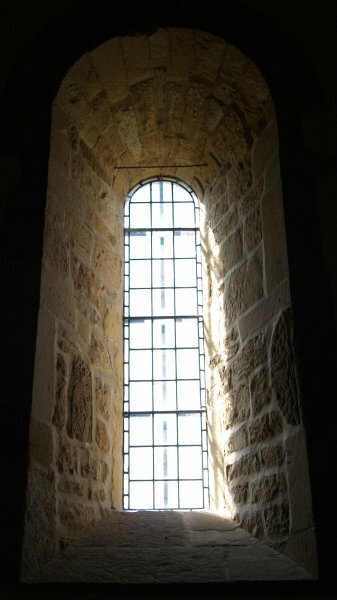 on the south wall of the nave. 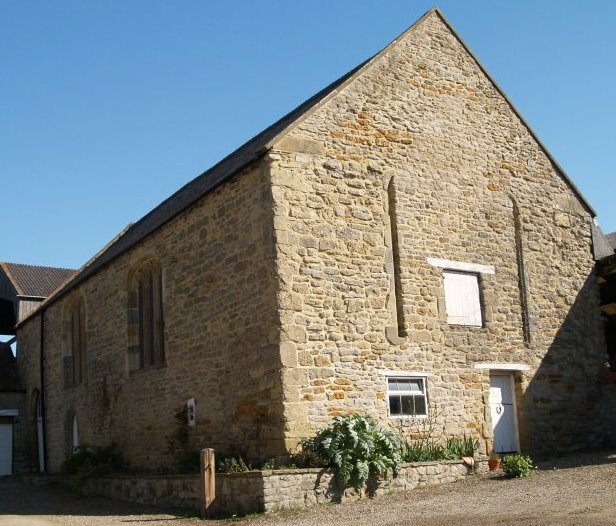 Near the church is a very old building used as a barn. 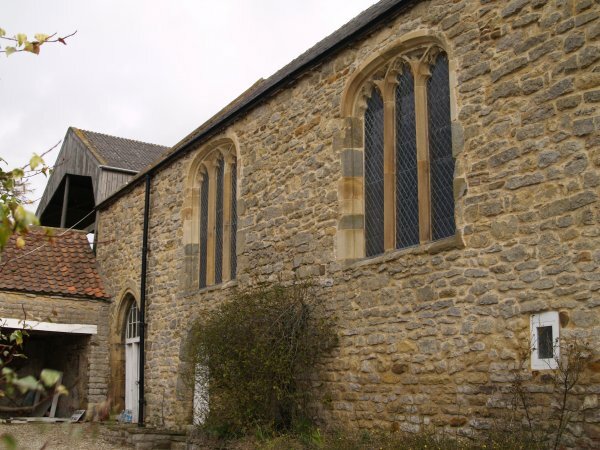 It is partly restored but deserves more respect and conservation work on it. 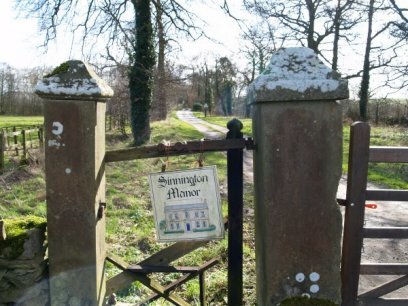 It is referred to as Sinnington Hall and may have been the great hall of a manor house or castle? 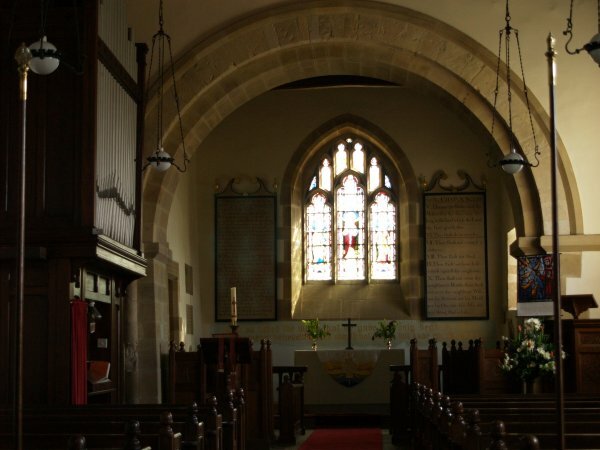 but it dates from the late 12th century and re-windowed in the 15th century (Pevsner). 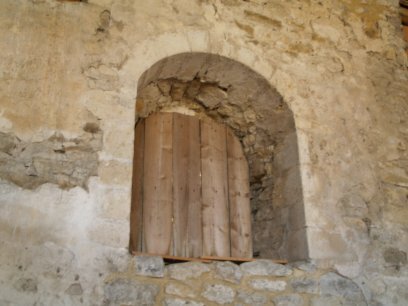 Some of the original stonework of the doorways survive. 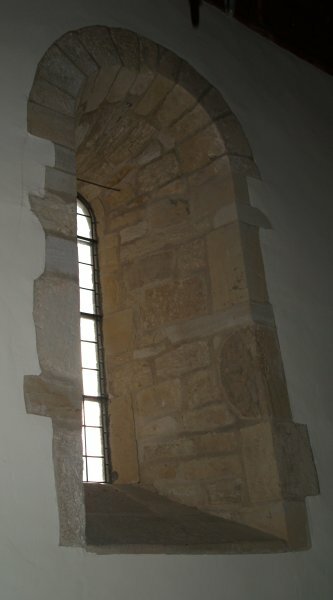 Two 'slits' with curved ends is all that remains of the great four light window on this wall of The Great Hall. The bridge of one segmented arch (dated 1767) over the River Seven. A view of the village from the River Seven Bridge. 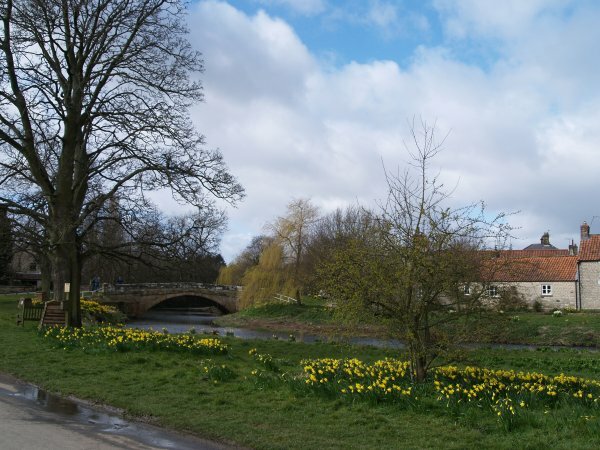 Spring daffodils by the River Seven flowing through Sinnington Village. 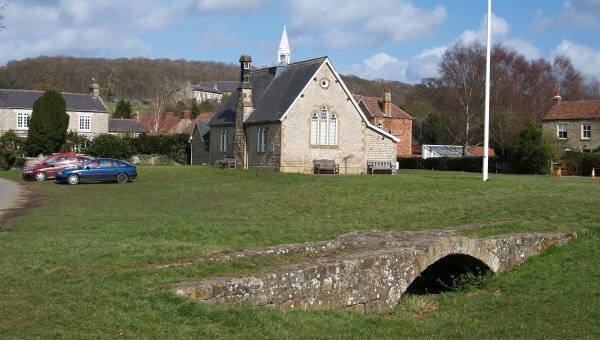 The funny little bridge and the old schoolhouse. 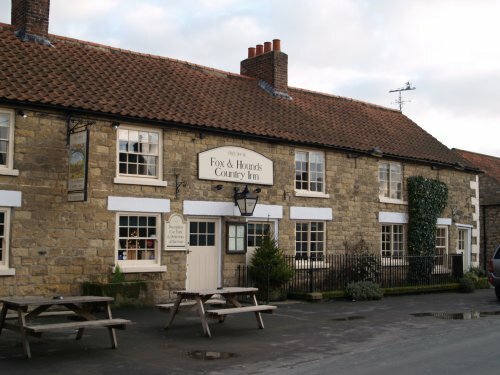 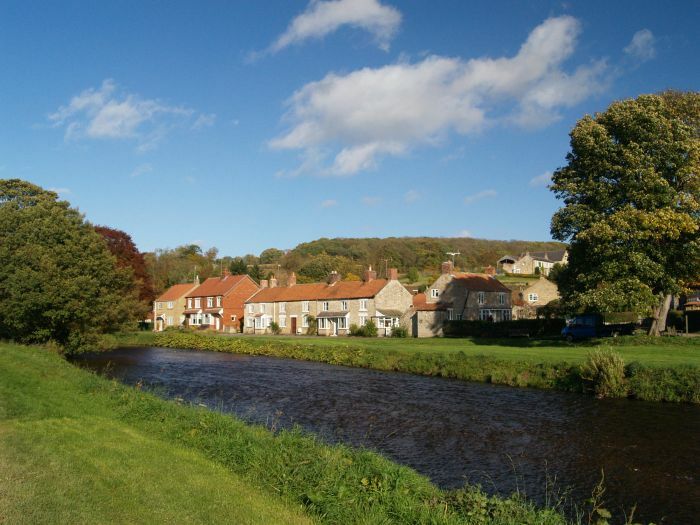 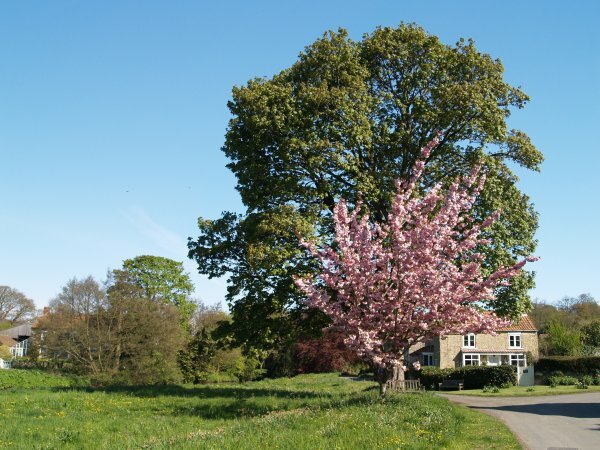 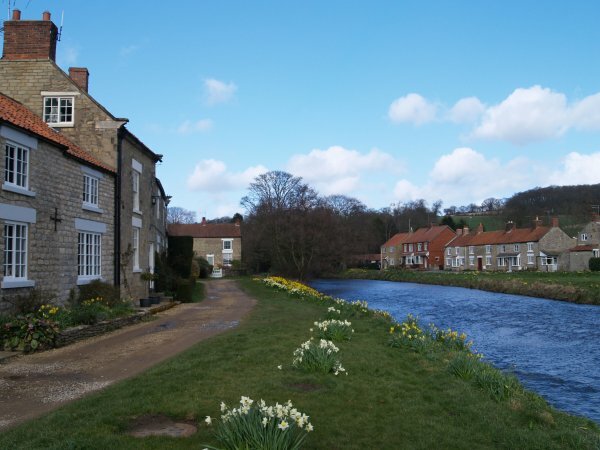 Sinnington, Ryedale, North Yorkshire, Northern England - the Fox and Hounds Country Inn is in the village of Sinnington just off the busy A170 Pickering-Helmsley road. 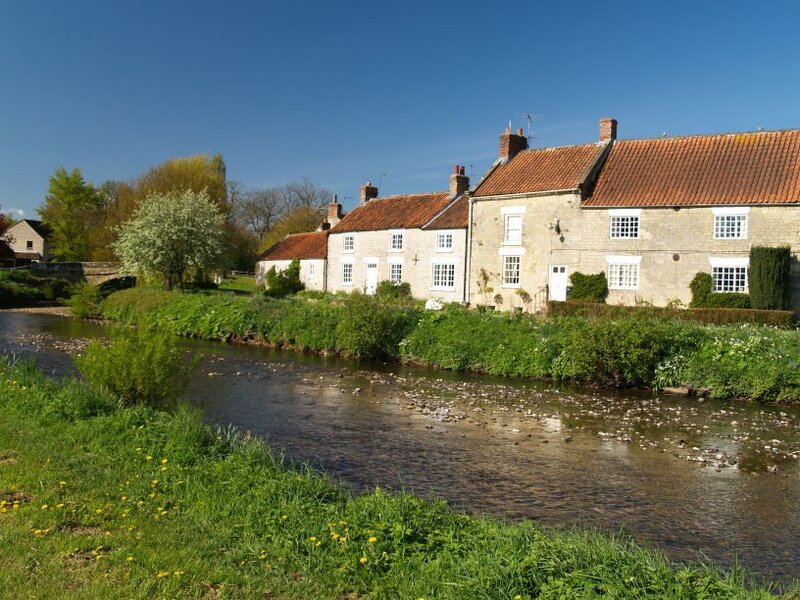 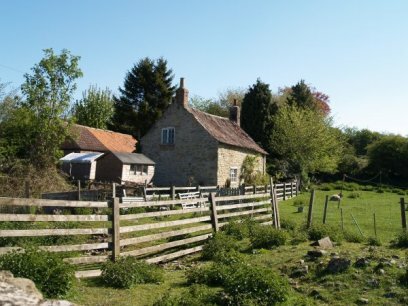 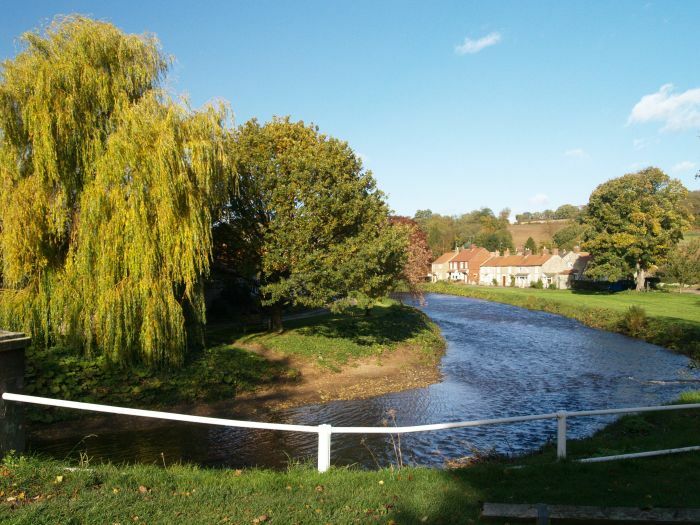 It offers good pub food and beer and is situated in an attractive and interesting village to walk around and to do a circular walks in the area too. 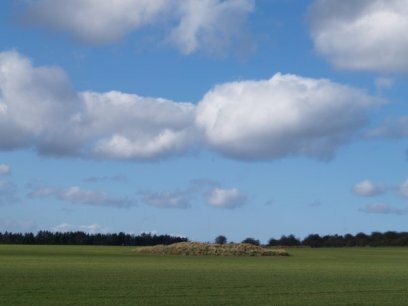 There is a ring cairn-tumulus set back in a field on the north side of the A170 road opposite the road down to Sinnington Manor. 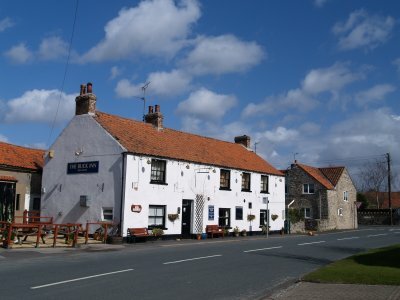 Wrelton, North Yorkshire, on the edge of the North York Moors National Park, North Yorkshire not far from Sinnington: The Buck Inn is the only pub in Wrelton, a very quiet small village just off the busy A170 Pickering-Kirkbymoorside road. 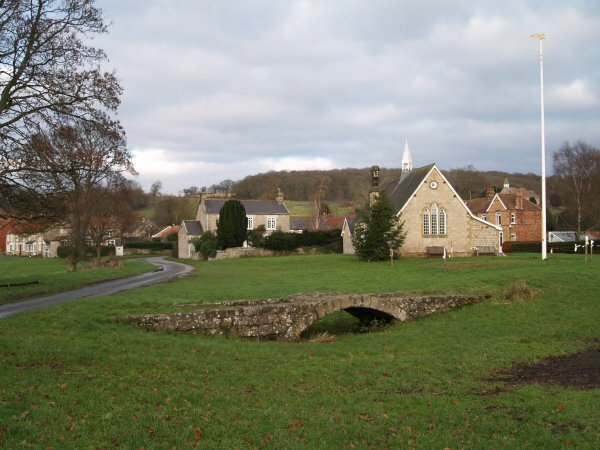 Wrelton was probably a hamlet in medieval times but few, if any? 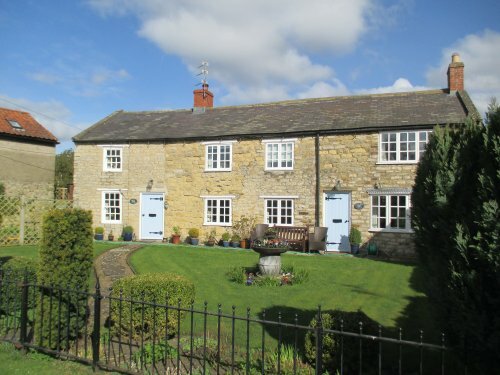 really old buildings remain but there seems to be an abundance of holiday cottages. The Buck Inn provides sanctuary from the holiday traffic providing a friendly welcome, good bar meals and hand-pulled ales. 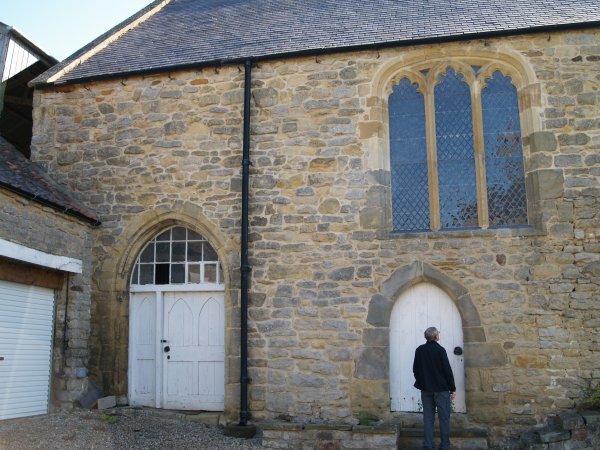 Enter place, walk, church, geographical feature, anything of interest!